I am often asked would top my list of favorite Norwex products. I use Norwex throughout my house, every single day, so it is hard for me to narrow it down! I tried though - and here are what I would consider my Top 10 Daily Use Norwex Products as of today. 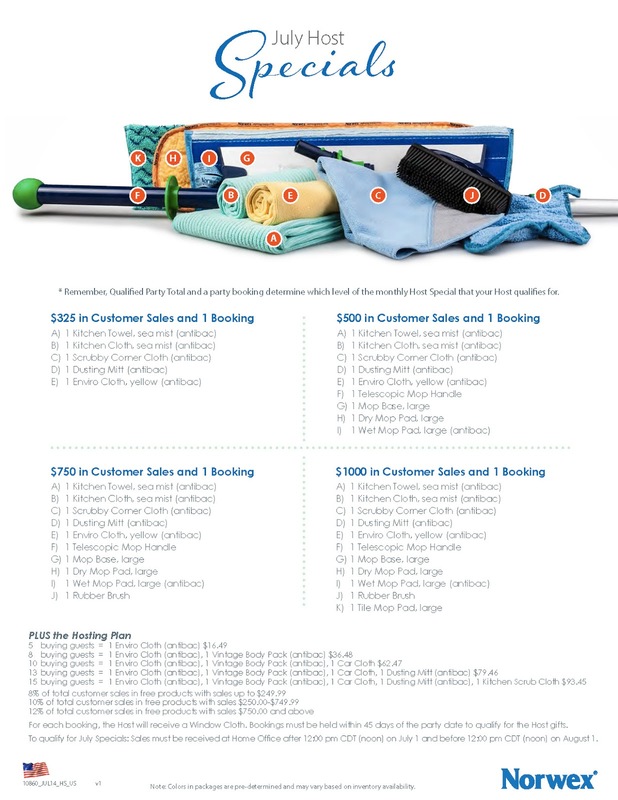 We'll just assume that the Household Package is a given with the Enviro Cloth, Window Cloth, and Dusting Mitt - since that is absolutely hands down the number one Norwex set to own. Hair Turban - I love the Norwex Hair Turban. I wrap my hair after I shower, then get dressed. It doesn't budge from my head, and I don't have to strategically balance it like I would a towel. By the time I'm ready to do my hair, the Norwex Hair Turban has pulled nearly all the moisture out of my hair and it is practically dry. I have very thick, medium length hair, and every day I am amazed at the Norwex Hair Turban. Body Cloth - I haven't used body wash, facial wash, body soap, or any facial cleanser or exfoliator since March of 2013. 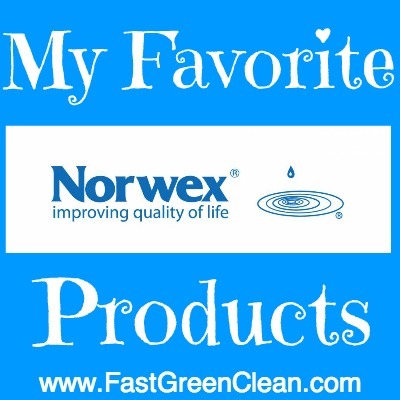 The Body Cloth is absolutely one of my favorite Norwex products - I use it every day in the shower to wash my face and my body, with just water. My skin is more balanced, and it has helped get rid of the eczema patches that showed up on my legs while I was pregnant. I don't even get that weird 30-something-year-old breakout acne anymore. Even my kids use the Baby Body Cloths with just water - no soap! I love that we aren't using toxic chemicals and questionable ingredients on our skin. Optic Scarf - Although I alternate between wearing glasses and contacts, the Optic Scarf is good for so much more than just glasses. I use the Norwex Optic Scarf multiple times a day - for glasses, sunglasses, phones, iPads, iPods, tablets, Kindles, and computers. I keep one in my car, one in my purse, and one in my kitchen. 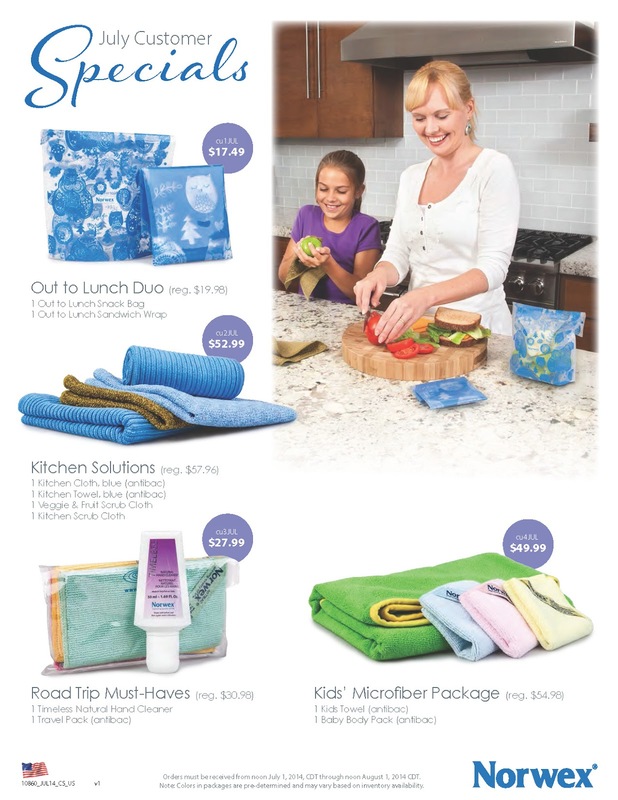 Kitchen Cloth - The Norwex Kitchen Cloth is great for wiping up crumbs and messes on counters and tables. Sure, the Enviro Cloth can do this too, but the Kitchen Cloth has a different weave, with ridges, that makes it excellent for picking up and holding onto the crumbs. With kids in the house, it is a must have. Plus, since it just needs water, my children can help clean up their own messes! Veggie & Fruit Scrub Cloth - I've posted multiple times about how much I love the Norwex Veggie and Fruit Scrub Cloth. We eat a LOT of fresh produce, and this cloth is invaluable. I use it for cleaning produce, peeling vegetables, polishing fruit, and even use it on eggs. Just click on the keyword for all my posts and photos. The results are incredible. Peppermint Foaming Hand Wash - I have received more compliments on the Norwex Peppermint Foaming Hand Wash than I have on any other Norwex product in my house. I don't think I have had a guest who has used the restroom, washed his or her hands, and come out to tell me how incredible the soap smells. Plus, I can always tell if my children are telling the truth when I ask if they washed their hands for dinner! It smells wonderful, and it doesn't contain any of the harmful ingredients I avoid in personal care products. Win-win! Timeless Lip Balm - I have the Norwex Timeless Lip Balm stashed around my house. I have on next to my bed. One in the bathroom. One in the kitchen. One in my car. One in my purse. Maybe that makes me a lip balm addict? Regardless, I love the Norwex Timeless Lip Balm. It has a pleasant, mild smell and feels silky smooth. It does not make me feel like I need to reapply every 15 minutes, and it does not contain any of the toxic ingredients I avoid in personal care products. Timeless Natural Hand Cleaner - I keep the Timeless Natural Hand Cleaner in my purse and in my car. If we are at home, I rarely use it, because we all love the Peppermint Foaming Hand Wash so much and washing hands is always preferable than using the Timeless Natural Hand Cleaner. However, with children, sometimes the Timeless Natural Hand Cleaner is necessary - at birthday parties, at grocery stores or while running errands. It does not contain any of the toxic ingredients I avoid and smells pleasant, while leaving our hands feeling clean rather than sticky or coated in something like some of the traditional hand sanitizers. Silver Care Toothbrush - If you think about it, toothbrushes are really gross. You use them to brush your teeth, and all the germs and food particles in your mouth are on the toothbrush. Sure, you rinse it, but then you leave it out for later use...hoping the rinse has removed all the germs and they aren't sitting on your toothbrush festering. On contact with water, the 99.9% Pure Silver Plated Head of the Norwex Silver Care Toothbrush releases active silver ions that produce a natural and continuous antibacterial process. Therefore, when you rinse the Norwex Silver Care Toothbrush after each use, the silver covering the head starts a natural self-sanitizing process to prevent the growth of bacteria. When the bristles are dry, the brush is sanitized. I love it! Crystal Deodorant - I have used crystal deodorant for about ten years now. I've tried different brands, I've tried different types (liquid, spray, rock crystal). The Norwex Crystal Deodorant is by far the best, most effective, longest lasting crystal deodorant I've ever used. What more is there to say?! There are many other products I use on a regular basis (like the floor system, Ultra Power Plus Laundry Detergent, and Fluff and Tumble Wool Dryer Balls! ), but for now lets just pretend I don't do laundry and mop the floor every single day. I'd love to hear from you, too! What are your top Norwex products? 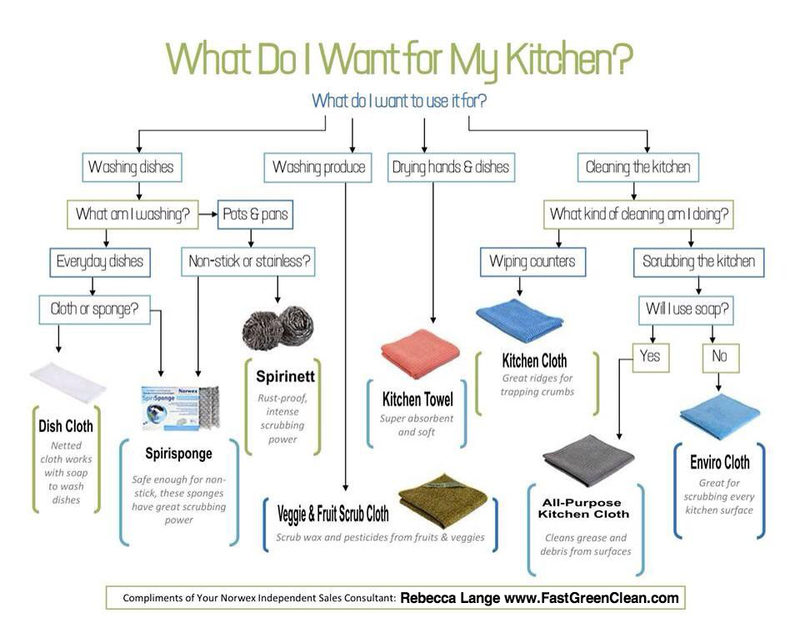 Another consultant created this handy little flow chart to help customers determine which Norwex product to use in the kitchen. My go-to is always the Enviro Cloth, but sometimes it is nice to have different cloths for different purposes. The main difference in the cloths is the weave of the fabric. If you're washing dishes, use the Dish Cloth or Spirisponge. Pro tip: Cut the netted Dish Cloth in half (or thirds, or fourths) and make it last longer! If you're washing pots and pans, use the Spirisponge, Mighty Mesh Pot Scrubber, or Spirinetts. Note: Spirinetts are not recommended for use on Teflon. Use the Kitchen Towel for drying hands or dishes. I leave mine hanging over the oven door handle for easy access and use! This cloth has a ridged fabric and is very absorbent! Use the Kitchen Cloth for wiping counters and tables. It is the same ridged fabric as the Kitchen Towel, which makes it excellent for picking up crumbs and spills. The All-Purpose Kitchen Cloth is great for cleaning the kitchen and using soap, and is especially practical for cleaning up grease splatters! This cloth has a fabric that is almost like a waffle weave - and does not have the microsilver in it, making it safe to use with soap. I highly recommend the Norwex Dishwashing Liquid! Everything else - the Enviro Cloth is the answer! Just use water! Do you have any tips or suggestions for cleaning your kitchen with Norwex? So this picture is only slightly embarrassing...I had a major mishap on my stove the other day, and then we left on vacation for a week...and well, it just didn't get cleaned right away. Baked on, caked on, dirty, disgusting grease and food all over my stove - looking at it I thought it would take me hours to clean, and put it off for a few more days. My go-to for cleaning anything in my house is the Norwex Enviro Cloth, so that was my first attempt with some warm water. It took a bit of elbow grease, but five minutes later - look at the difference! It's certainly not perfect, but I suspect some Norwex Cleaning Paste and a Norwex Spirisponge would finish the job in another few minutes. The best part? NO CHEMICALS! 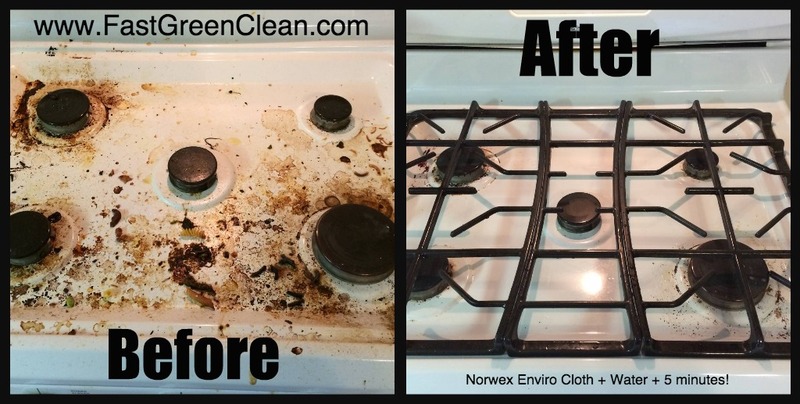 Norwex Enviro Cloth + Water + 5 minutes = No match for a dirty stove!